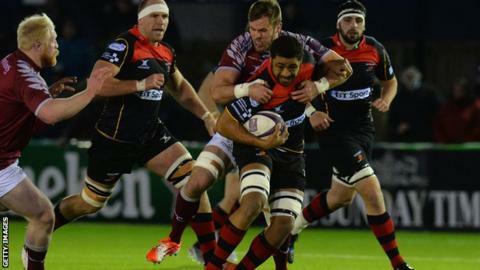 Taulupe Faletau will captain the Newport Gwent Dragons in what is likely to be his final appearance at Rodney Parade. Wales number eight Faletau is heading to Bath in the summer and will lead the Dragons against Ospreys. "The only time I've been captain before was playing FIFA," Faletau said. "I'm not really thinking about it being about my last game at Rodney Parade." "It is an honour to follow some top names in captaining the side." Faletau revealed that he found a move to the Premiership too good to turn down after seven-years with the Welsh region, though he admits he leaves the Dragons with a heavy heart, having been raised in Pontypool. It's the club that has given me the chance to go on further and do things but it's the right time to look for a new challenge and take it on," he said. "It's something fresh. I'm looking forward to a new challenge and going into a new environment. "I've been here since starting playing professional rugby and it will be a different environment with different people to work with. "But we've still got a lot to play for in the Challenge Cup and can still finish on a high in the league by winning a few games towards the back end." Friday will represent Faletau's final bow at Rodney Parade unless the Dragons beat Gloucester in the quarter-final of the European Challenge Cup and Sale also beat Montpellier in the quarter-finals.